Adare enjoys a wonderful reputation for its excellent award winning restaurants, serving delicious food throughout the year in warm and welcoming surroundings and it is often referred to as the “gourmet village” of the Mid-West. 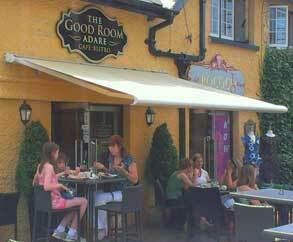 The bars in Adare also have a reputation for excellent bar food, serving traditional Irish home cooked meals. The gracious splendour of The Oak Room sets the scene for Adare Manor’s fine-dining experience. Providing a genuine taste of the best that contemporary Irish cuisine has to offer, The Oak Room restaurant invites guests to explore the culinary treasures of Ireland. The Oak Room was the original family dining room, host to countless intimate family meals and glittering dinner parties throughout its long history. At The Oak Room presentation of each dish adds another layer of regional character to every meal. The culinary team has collaborated closely with local artists working in wood and ceramic to create bespoke serving pieces, including some sourced from Adare Manor’s own woodlands and some inspired by the River Maigue which flows through the estate. Award-winning Head Chef Michael Tweedie has devised spectacular tasting menus for The Oak Room, drawn from the rich gifts of the Irish landscape. Every care has been taken to source the highest-quality ingredients from Irish artisan producers, including many local suppliers. Exquisite seafood, sustainably farmed meats and game, the bright flavours of freshly-picked vegetables and some special touches foraged from the grounds of Adare Manor itself will take guests on a journey through the distinctive terroirs of Ireland. “1826 Adare is located in the postcard pretty village’s most charming thatched cottage. 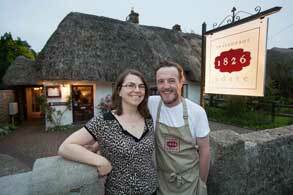 This is one of the defining examples of a modern creative Irish restaurant”. Striking a delicate balance between solid Irish cooking and modern innovation, husband and wife team Wade and Elaine Murphy are hitting the spot with fresh, comforting dishes. Awarded a Michelin Guide Bib Gourmand in both 2016 & 2017. Awarded Best Restaurant in Limerick & Munster 2014, 2015 & 2016 by the Irish Restaurant Awards, the only restaurant in Munster ever to achieve “3 in a row”. Housed in what looks like a large dolls house, the “Wild Geese” Restaurant is a series of cosy rooms with its open fires and clutter of Victoriana. The cooking style is sophisticated and the results are delicious. Typically, starters may include a parcel of Kenmare smoked salmon stuffed with crabmeat served on a cucumber and dill salsa. More homely dishes also feature. The tasteful style and emphasis of the use of the best of fresh, local produce, from land and sea, has made this one of Limerick’s most sought after eateries. Quality and taste are the highest priorities. Fully licensed for Wine, Beer and Spirits. Menus available on website. “The food is delicious and postcard pretty, the setting is sublime, whilst the service from Ms. Randles is simply as good as it gets”. So say McKennas’ Guides. Our Awards include McKennas’ Guides, Michelin, Georgina Campbell and TripAdvisor. Breakfast served from 9.00 to 11.30 Tuesday to Saturday inclusive. Lunch served from 11.30 to 4pm Tuesday to Saturday inclusive. Dinner served from 6.00pm Tuesday to Saturday inclusive. Sunday lunch from 12.30pm to 3pm. Reservations highly advisable, especially during the peak summer months. 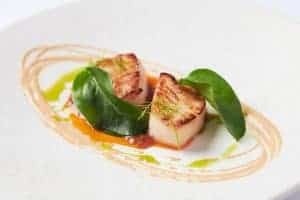 The renowned multi-award winning, French Cuisine “Maigue” Restaurant at Dunraven Arms Hotel has received the highest accolades for it’s superb cuisine. The restaurant has an excellent reputation for serving local and seasonal produce. One of the unique features of the restaurant is the roast rib of beef carved from the trolley every evening. Renowned multi-award winning, French Cuisine “Maigue” Restaurant has received the highest accolades for its superb cuisine. The restaurant has an excellent reputation for serving local and seasonal produce. One of the unique features of the restaurant is the roast rib of beef carved from the trolley every evening. Serving breakfast and dinner daily, the Maigue Restaurant offers perfectly cooked Irish cuisine with a contemporary twist. This beautifully furnished room was recently visited and enjoyed by the legendary Michel Roux OBE. 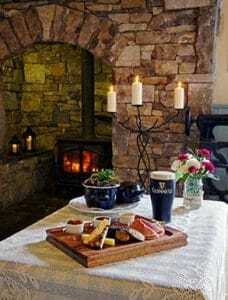 The restaurant has been awarded the ‘Best Breakfast in Ireland’ and this is reflected in the magnificent breakfast buffet and the baked Limerick ham cooked and carved every morning. Three AA rosettes for food, Gilbey’s Gold Medal award, Egon Ronay, Mouton Cadet and Bord Failte Awards for Excellence, are among this restaurant’s many achievements. Soup, sandwiches and a hot dish of the day are available every day in the bar. Open daily, all year round. Dinner is served from 7.30pm to 9.30pm; Lunch is served from 12.30pm to 2.15pm. Reservations highly advisable, especially during the peak summer months. Relax and allow our experienced team to exceed your expectations in our cosy, comfortable and intimate fine dining restaurant. Our ever changing and imaginative menu ensures that you can savour the flavour of the best of local Limerick produce. Our philosophy is to work with seasonal ingredients respecting their natural flavours and using fresh herbs from the Fitzgerald Family Herb Garden. Fieldings has a very wide variety of fine wines, including organic, fair trade and carbon neutral wines to compliment each dish. Dress code for dining in the restaurant is smart-casual. Unwind in an ambiance of relaxed elegance at the magnificently renovated Carriage House. A three minute walk from the manor house and boasting arresting views of the surrounding landscape, The Carriage House has been designed as a dining destination of effortless luxury. 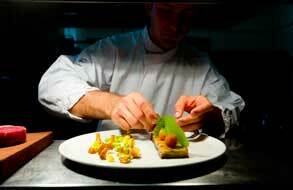 The Restaurant experience centres around exceptional food and impeccable service. The glazed terrace makes it possible for guests to enjoy the benefits of the stunning vistas year-round. A relaxed breakfast menu is served every day, while lunch and light dining options are available each afternoon. Fresh local produces takes centre stage, and the heart of the space is the show-kitchen, where guests can watch the chefs prepare each perfect dish. Refined salads and sandwiches, and gourmet pizzas have a wide appeal for guests looking for casual mid-afternoon refreshment. Renowned locally as one of the best restaurants in Adare, Timmy Macs Bistro in Adare is the ideal restaurant for a corporate or family gathering. Our menu features healthy food options created by our dietician and our Chef. Vegetarian and Authentic Irish dishes are available. Our extensive menus offer something for everyone. We specialise in Gluten Free dishes, which are clearly marked on all our menus. Our menu also features Heart Healthy, Vegetarian and Authentic Irish dishes. We have built relationships with our suppliers to ensure we are using the freshest Irish local ingredients as possible. At Timmy Macs Bistro we aim to provide high quality food, value for money, a unique comfortable environment, and friendly professional service. Celebrating 30 years of fine dining, our restaurant continues to be among the nations favourite. 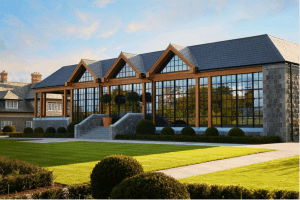 The Restaurant has picked up many national awards, including ‘Best Irish Restaurant’ and ‘Best Hotel Restaurant’ and featured in the 2019 Munster Regional Final for Irish Restaurant Awards. The restaurant is legendary with orchard and herb gardens providing synergy with the kitchen. The busy, buzzy dining room is open to residents and non residents and is the ideal venue for a romantic dinner for two, a family celebration, an intimate gathering or a country house style wedding. Menus reflect the ethos of the restaurant – to serve seasonal ingredients from local producers to excite the eye and tantalise the taste buds. Our most recent Award is ‘Best Front of House Team’ 2018 – Yeschef. 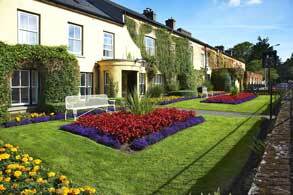 The Dovecote Restaurant, open daily from 9am, is situated at Adare Heritage Centre is renowned for its fast and friendly service, and offers authentic Irish cuisine in a casual bistro style restaurant. This restaurant is specially known for its delicious quiches and the restaurant offers an extensive range of hot beverages and a homemade dessert menu. Open daily from 9am and offers a wide range of food for breakfast, lunch, daily specials, snacks, sandwiches and light refreshments. 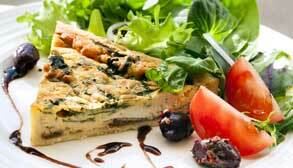 This restaurant is specially known for its delicious quiches. The restaurant offers an extensive range of hot beverages and a homemade dessert menu. There is also outdoor seating on the terrace for those sunny days. The restaurant provides a Catering at Home Services for those special occasions like Christmas gatherings, First Communion, Confirmations and Summer season outdoor occasions, and for the not so happy occasions, funerals. For all of you who live a busy life yet want to provide the next best thing to a home cooked meal for your family, contact the Dovecote and order a delicious Lasagne, Beef Stroganoff, etc. and just pick it up on your way home. For any visitors who are staying in Self-Catering accommodation why not stock up the fridge for your holidays from our Catering at Home Menu, available on our website. The Restaurant is adorned with paintings by local artists, which can be purchased at the Centre’s information desk. *Winner* Cafe of The Year Munster. Proudly listed in McKenna’s Guides 2019. The Good Room continues to grow and flourish. The cafe houses indoor seating for 50, bakery stands, to-go fridges and also has a beautiful outdoor terrace with heaters and blankets. The food is simple, uncomplicated, local where possible and most importantly all cooked and baked in house. Our menus are inspired by food that is formed and foraged with an emphasis put on the season. The Good Room offers all-day brunch on every weekend and bank holiday, with all-day breakfast options, as well as a variety of vegetarian, pescatarian and meat-lover dishes to choose from! Breakfast is served Monday-Friday from 8.30 am until 11.50, with the menu including porridge, granola and veggie options, and for the health-conscious, our no-carb option with avocado, bacon, poached free range eggs and grilled tomato. Lunch includes a variety of organic salads, or for the more peckish customer, our menu options include fish of the day, Rigneys sausage beans and toast, lamb tagine with couscous and our famous burgers to mention a few. Sean Collins & Sons Bar Adare. Situated at the top of the main street Adare this comfortable old style pub has built up a great reputation for locally sourced and great value food. The Bar and Restaurant has established a great reputation for quality, locally sourced, Irish food. The menu comprises of steaks from Costello’s local butcher, fresh cod and chips, pasta, pizza, homemade burgers and more. This 1980’s style bar is very comfortable, spacious and bright and they have kept the original peat burning stove, where Sean’s grandmother cooked the most amazing Irish stew and a delicious apple pies. The Bar and Restaurant has established a great reputation for quality, locally sourced, Irish food. 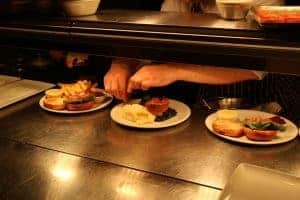 The menu comprises of steaks from Costello’s local butcher shop, fresh cod and chips, pasta, pizza, homemade burgers and much more from their wonderful food menu. They cater for birthday parties, family gatherings, wedding parties and BBQ’s. The bar dates back to 1850 and has been very popular with both local residents and visitors to the region. The premises was purchased the Loftus family and renovated and extended and transformed into a modern restaurant and bar while retaining its old world charm. The bar dates back to 1850 and has been very popular with both local residents and visitors to the region. The premises was purchased by Fiona Loftus and her late husband Trevor and renovated and extended and transformed into a modern restaurant and bar while retaining its old world charm. The furnishings are of superior quality, marble counter tops and hardwood flooring, and the décor is warm and inviting and the overall atmosphere is very relaxing and welcoming. 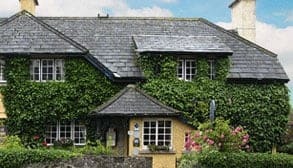 This country Irish bar & restaurant has built up a fantastic reputation for serving traditional Irish meals as well as a host of international dishes. 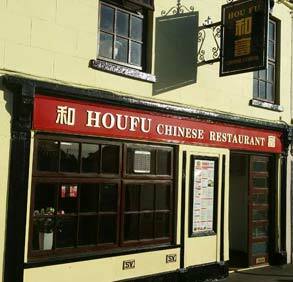 The Houfu Chinese Restaurant is situated in the centre of the village of Adare and serves a feast of authentic eastern cuisine. Our menu spoils our customers for choice with a range of starters including our very popular grilled aromatic lamb and grilled spring prawns to mention just a few. Our delicious prawn dishes include our house favourite, steam king prawn with garlic and soya sauce and Kung Po king prawn. The restaurant has been newly renovated with beautiful décor and gives our customers a comfortable and pleasant dining experience and is an ideal place to celebrate that special occasion or to just dine with your friends. Our menu spoils our customers for choice. We have a range of starters including our very popular grilled aromatic lamb and grilled spring prawns to mention just a few. Our soups include hot and sour soup and won ton soup leading on to a variety of delicious Thai and Chinese main courses. You will love our range of poultry dishes; chicken in Thai red curry, chicken Szechuan sauce; our 100% Irish beef dishes includes our classis amber fire Hennessy beef. Our prawn dishes include our house favourite, steam king prawn with garlic, and soya sauce and Kung Po king prawn. We cater for every palate. We are open Monday to Saturday from 4 pm to 12am and Sunday and Bank Holiday 1pm to 11pm. Book a table or order take away. George Stacpoole, Michelina, Sebastian and Helen, have just opened Stacpoole Coffee House in Adare. George considered that it was time to reinvent, so a coffee house has been established where delicious coffee, tea and food is served both in the garden to the front of the premises, and in the dining room at the rear of the antique shop. As in the 1700s, the foundation of the 1st coffee houses were places where customers could indulge in gossiping, politicking, reading and enjoying life. It is the same today, the only difference is you are surrounded by wonderful objects that can be bought in store. There is a wonderful old world ambience inside with comfortable furnishing, and the walls are adorned with paintings and other objet d’art. 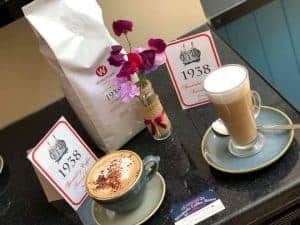 Choose to sit in the front garden and watch the world go by…it’s truly a most relaxing coffee shop, where all food products are locally sourced and where your special requirements are attended to, in a warm friendly manner. Start your day with a New York Style toasted bagel, during the day enjoy hot and cold sandwiches, salads, desserts, ice creams, or ice cold drinks. Go Italian…try Michelina’s Taste of Home, Parma ham with sun kissed tomatoes. All sandwiches are served with a side salad and Gluten free bread is available. The Coffee House is open Monday to Saturday 9.15 to 5pm and Sundays 10am to 4pm. Afternoon Tea is served 2pm to 5pm each day. 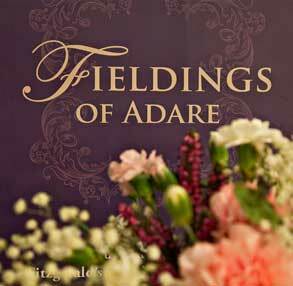 It is advisable to pre-book for this very special treat which costs €20 per person. We offer an extensive bar menu with a wide range of Irish and international dishes for all appetites. Some of our daily specials include Traditional Irish Stew and Fresh Smoked Salmon. Our meals range from lunches to dinner with the option of finger food available for groups. All our produce is bought fresh from local markets. All our produce is bought fresh from local markets. Ask a member of staff for the source of all our meats and vegetables. All our meat is 100% Irish and supplied by Costelloe Butchers, Adare. Starters include Atlantic Seafood Chowder, Main Dishes include Pat Collins Burger, Homemade Battered Cod, Scampi and Chips, Sizzling House Stirfry, Gourmet Sandwiches include Bacon and Brie Panini, Tuna and Brie, Chicken Pesto Panini, and we serve a wide selection of wines. We also have a Kids Menu. We are open from 10.30am till late serving food up to closing time.